This is a picture of our dinner from last night. I like these 'bung into the oven, take out and eat' meals. Stack the ingredients in 3 layers in the baking tray or vessel. 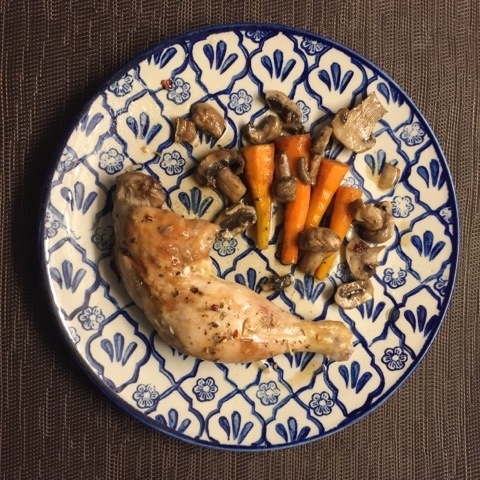 Sliced mushrooms first, topped with peeled baby carrots and then chicken legs on top. Flavoured with a bit of honey, balsamic, sea salt, extra Virgin olive oil, sea salt and crushed black pepper. Wrap in a foil or put a lid to cover and roast it in a preheated oven for 20 min at 200C. Actually there was no foil at home so I put a baking tray on top of a glass baking dish in which the food was kept. You thought only Indian housewives can be ingenious in the kitchen? We men are not as 'useless' (tongue firmly in cheek) in the kitchen as made out to be. Take the baking dish out of the oven, using mitts (it will be very hot), and remove the cover. Turn the chicken around so that it cooks evenly. You keep the chicken on top as you want the flavours of the meat to seep into the veggies. Put the baking tray back into the oven. The tray should be uncovered this time so that the chicken browns a bit. Add some dry herbs like oregano, paprika etc if you have any at home. I have purposely not put measure. I just see what's at home and add in. The trick it so not add too much of anything. Grill (with no lid on top unlike when roasted) for 15 min at 200C. Let the food rest in the shut oven (it will become cold if the door is open) for another 10- 15 min and then eat. You can have some toast on the side if you want. While plating, top with a bit of the juice that has come out. The best part was that no blood, sweat or tears was involved in its preparation. Grills and roasts are a weekend favourite in our house. Though I sear the meat on a high flame on a pan under strict eyes before it goes in the oven. I find that this technique retains the juices and the we get a lovely crust as well. The juices leftover in the pan are used for a quick stir fry of mushrooms with corn & peppers. These veggies may go in the oven as well or we have it spread on a garlic toast like bruschetta. Hi Sudeshna, that's a classic steak technique isn't it? Do you use oil? I was mulling with the idea of searing it a bit after cooking. If I was doing it for guests that is. Yes, I do use a Lil bit of oil and do this on a really good quality non stick pan. You can use the air fryer as well. Does this method work with pork as well?